Caring for a loved one with Alzheimer’s or dementia often becomes a full-time job for family members. While you want to be a great primary caregiver, you also need to attend appointments for yourself, go to the grocery store, and handle other household chores. Securing outside help is an important way for caregivers to get the breaks they need to carry on their own lives while caring for an Alzheimer’s patient. Here are a few suggestions on types of outside help that will make providing care to your loved one with Alzheimer’s little more manageable. There is no shame in hiring a housekeeper when you are spending all your available time caring for your loved one with Alzheimer’s. 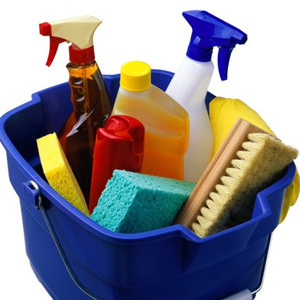 Knowing that someone else is responsible for washing windows, cleaning bathrooms, vacuuming, mopping, and dusting will give you peace of mind and give you the time you desperately need each day to take care of all non-cleaning related tasks you do each day. Some housekeepers also do laundry and make beds. It’s important that you are clear with your expectations during the interview so candidates understand your situation and needs. Make sure the prospective hires know that you care for a patient with Alzheimer’s and there may be days that you will not be home because of appointments while they are working. They also need to understand that your loved one may become agitated for a bit with a new person in the home and that everyone will need to be flexible until your loved one becomes more comfortable with a housekeeper moving items and making noise while cleaning. If your loved one is in need of more physical care than you can provide, it is time to seek outside help. Professional nurses and caregivers will provide in-home care as often as you need them, and they can administer medication and carry or move your loved one if you can’t do it yourself. Professional caregivers also are in a better position to handle your loved one’s outbursts and violent tendencies than you are. They know how to calm Alzheimer’s patients and handle their physical and emotional needs because they do not have the emotional attachment to them that their family members do. Sometimes, caregivers need professional help because they don’t have anyone else who can sit with their loved one while they go to a movie, spend time with friends, or care for themselves with a visit to a doctor or a fitness class to relieve stress. Caregivers often do not take proper care of themselves, and it’s crucial for your own health and well-being to allow a professional caretaker to take over every once in awhile so your health does not suffer. One of the toughest challenges caregivers face is not getting enough sleep either because their loved one does not sleep well or because they are so busy they cannot get a full eight hours of sleep each night. The stress of being a caregiver also makes it difficult for caregivers to get quality sleep. That’s why enlisting the help of a night nurse is an ideal solution for caregivers coping with an Alzheimer’s or dementia patient. Night nurses can help the patient use the restroom at night, provide supervision if your loved one wanders or experiences sundowning that is associated with Alzheimer’s, and provide socialization and mental stimulation to occupy your loved one when he can’t sleep. Trained night nurses will offer the care that your loved one needs so you can get high-quality sleep and not have to worry about your loved one all night long. Outside help can be a lifesaver for caregivers of patients with Alzheimer’s or another dementia. Housekeepers, professional caregivers, and night nurses make caring for an Alzheimer’s patient much more manageable for family caregivers.